Haha, more like "Triple Mistake Stack of Regrets." But we'll get to that part later. The first thing you'll notice is that this unit of food is a "stack." Unlike tacos, burritos, quesadillas, and such, this wad of food has no existing culinary equivalent of which to be a poor American-fast-food-imitation. This was probably invented by the same powerful minds at YUM! Brands HQ that brought us KFC's Double Down--which you'll recall is a sandwich with fried chicken where the bread should be and bacon and cheese in between. This time they were all "Ah screw it, just fold it inside a thingy and call it a stack of meat. They'll eat it." Regular diners of TheBell will already know that there are no stacks with any quantity of meat other than triple. Which is odd, because there had to be a single meat at one time to arrive at the ratio of 3x the meat. 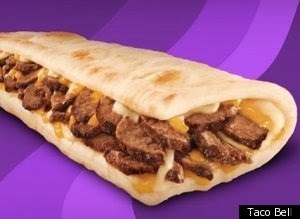 I even Ctrl+F'd the Taco Bell website just to make sure there wasn't a Single or Double Meat Stack. Maybe it's just called a Steak Fold. That sounds gross. Although, by doing this I did discover that there is also a Triple Chicken Stack (for all you vegans out there). Just like the promo picture! I think that the correct way that they probably want you to eat this is the "keep it in the foil and unwrap incrementally as you eat your way to the bottom" technique. Naw dawg, I'm picking this thing up raw so I can feel all nine inches of the soft, squishy, powdery bolillo flatbread in my fingers. The Stack is even sadder and floppy-er without the support of the foil. I had to cradle it gently in both hands to keep it from ripping or spilling its savory innards. Okay so construction. Maybe you can tell from the picture, maybe not: all of the meat is in the middle. Like the enterprising young taco chef just dropped a handful of steak in the middle, threw on some cheese and then squished it in half. In fact, that's probably in the training video--some guy totally resigned from life and possibly high on marijuana just being all like "and then ur gonna just like take a handful and put it on there and stuff, or whatever." Actually probably not. I bet they don't even touch the meat. It all comes pre-portioned from the corporate kitchen at exactly 260g and all they have to do is microwave it and dump it on the bread. Anyways, the point of all that was to illustrate the poor meat-to-breadflap distribution. The first two and last two bites were all bolillo and cheese, while the center was a little beef-heavy. I guess that just heightens the sensation of "WHOA ALL THE STEAK I'M EATING!" Oh yeah, cost. I didn't do my regular drive-thru analysis so I forgot to mention the price. The Stack costs $4.99 alone. I also bought 2 crunchy taco supremes for a grand total of $7.77. I know...right? No, not the trip-sevens. My meal at Taco Bell cost me nearly eight dollars. What the heck is this, Arby's? You should be able to leave Tbell with enough food to kill a horse (irony? (horsemeat joke)) for under $5. Incidentally the Stack may just kill a horse if a horse were to eat a Stack. "Hey, I thought this section was called 'Eating It' so when are you going to eat it?" thought the reader. So with both hands I flop the tip into my mouth and start going at it. This bread is gross. It is too soft and puffy. Have you ever slept on sheets made out of sweatpants material? And like, you get that feeling that you're just snuggling on top of a fat person? Yeah, someone who is too obese to buy normal sized clothes but not big enough yet that they go full snuggy, and so that pretty much the only thing they wear are sweatsuits. You don't feel that way about jersey sheets? Hmm, well anyways, this "bolillo flatbread" is the mouth equivalent to sleeping on fat people sweatshirt. After a couple of bites I've got some of the good stuff in my mouth: steaksteaksteak. And it's real steak! How can I tell? Because it is tough and difficult to rip with teeth. And they left in plenty of gristle, just to let you know: Hey, Real Steak^TM. While "steak" implies cow, I don't see this explicitly stated any place so, caveat emptor. Mistake #1: Getting Tbell to begin with. Mistake #2: Eating the tacos first. Mistake #3: Finishing all the food. This was rough going. It will undoubtedly wreak havoc upon my delicate and finely tuned gastrointestinal system. Flavors. You know about the bread already. 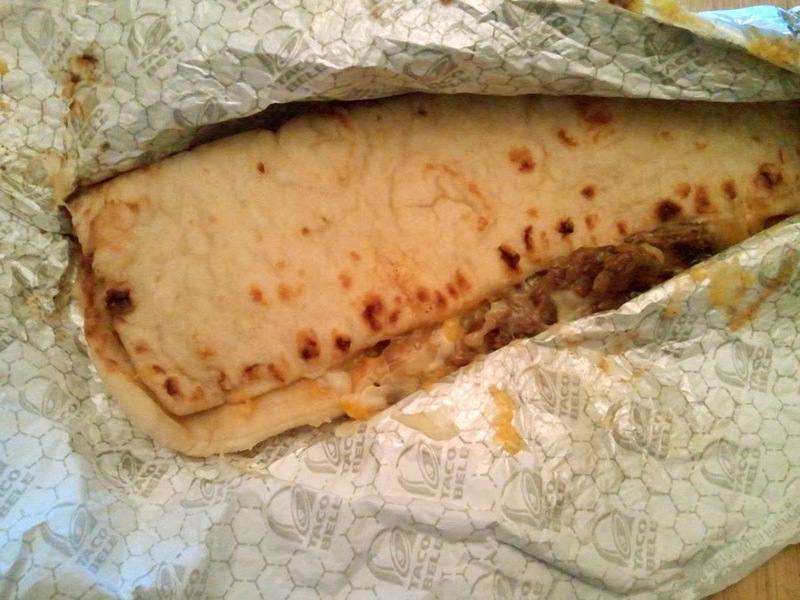 The cheese is like all other Tbell cheese--melty, gooey, delicious. The steak has been heavily marinated (probably also heavily tenderized). The flavor of the marinade is not particularly Mexican, per se. Take some smoke-house flavored beef jerky, then reconstitute it with ketchup and an Ortega packet. That's ballpark what you're eating here. What we lack in quality, we certainly make up for in quantity. In fact, this Stack has three times the amount of steak that one would normally expect on a cheesy meat fold. 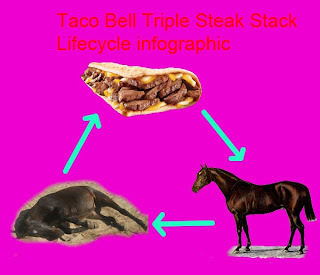 Overall, I cannot recommend the Taco Bell Triple Steak Stack. At 5 dollars it is not a good value. For the money you do not get substantially better ingredients or even necessarily more food. And taste-wise, it is far from the best thing that a person could order from Taco Bell. Plus, it actually makes you worse at basketball, despite what is depicted in the commercial. Do yourself a favor and get a couple Cheesy Gordita Crunch tacos instead (w/ Doritos shell for the advanced user).